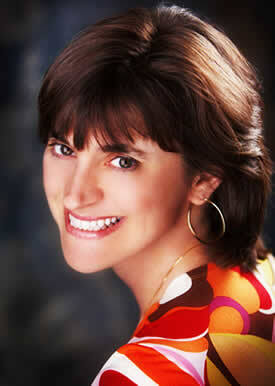 Please welcome debut author Claire M. Caterer to GreenBeanTeenQueen! 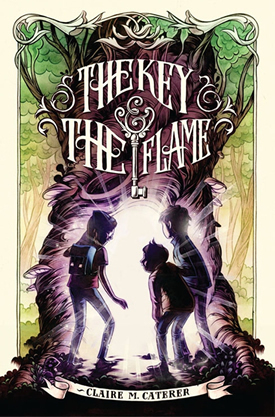 She's currently on her blog tour to celebrate the release of her middle grade debut, The Key and the Flame. I asked Claire to share her thoughts on libraries! 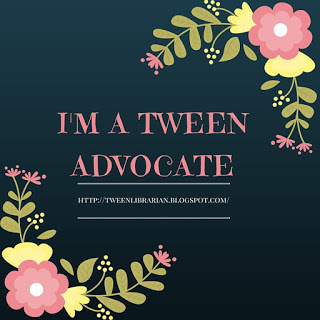 Thanks so much to Sarah for letting GreenBeanTeenQueen host a stop on my blog tour! Sarah asked me to talk some library love, so I’m paying homage to two special libraries I know. When I was 22 years old, I was a walking cliché: Midwestern girl with big-city dreams. Two days after receiving my college diploma, I hopped a plane to New York City, where I intended to get a job and become a famous writer. New York is a tough town to hang out in all by yourself. I knew no one, had no job, and the culture shock was extreme, though I never admitted it at the time. Still, I knew I needed to find a home base, somewhere I could feel like myself. So of course I went to the library. Even my cocky, I’ll-conquer-the-world attitude was humbled by this library. You know the one I mean: that grand, yawning building guarded by stone lions and opening into glorious, chandeliered interiors. It’s not a cozy place with armchairs and reading nooks. It’s intimidating. But that’s what I loved: I walked into it and felt small, just like I did when I was a kid in my small-town library, feeling the awe-inspiring weight of all those unread books. 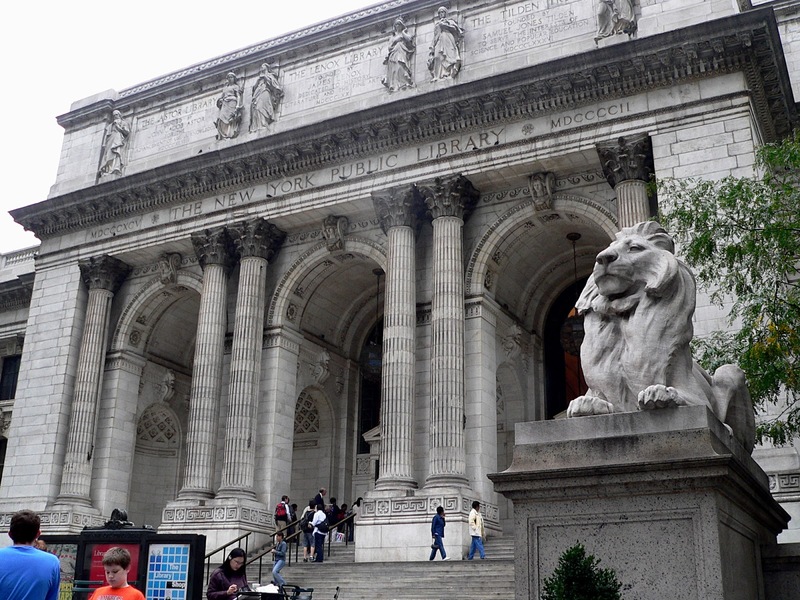 Despite its churchlike literary opulence, the NYPL was home. It held amazing secrets in its dusty back rooms full of ancient manuscripts. I could find anything there. I could hold in my hands letters written by a World War I doughboy to his girl back home. One entire room was devoted just to maps, for God’s sake. And like an alcoholic set loose on Bourbon Street, I marveled that another library was right down the block—the smaller, friendlier Mid-Manhattan Library. Here I could take home Jane Austen and Stephen King for free. All the books I’d been forced to leave behind in Kansas were here waiting for me in hushed rooms shielded from harsh voices and honking taxicabs. 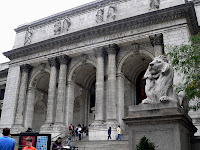 When I was swindled out of $200, when I was grinned at by gin-soaked men, when I wondered what I was doing in New York and why I didn’t go home, I wandered into the NYPL to feel that familiar weight of more books than I could ever read. I didn’t need to go back to Kansas City. I had my own chair under the window at the library. It was right there in the fiction section of the children’s room, where I could curl up, pull down a copy of The Lion, the Witch, and the Wardrobe, and know that I’d come home. Come back tomorrow for more blog tour fun at The Mod Podge Bookshelf, where Claire shares some embarrassing snippets of childhood writing. Get the full blog tour schedule right here. photo credits from top: 1. NYPL exterior by Ken Thomas (public domain), via Wikimedia Commons; 2. NYPL Maps Division by GK tramrunner229 (own work), reusable under GFDL orCC-BY-SA-3.0, via Wikimedia Commons; 3. 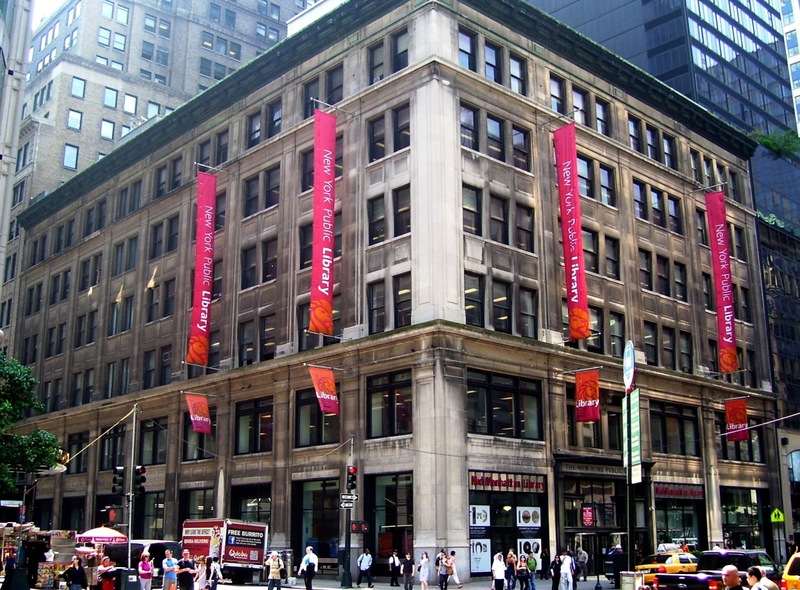 NYPL, Mid-Manhattan branch, by Beyond My Ken (own work), reusable under GFDL or CC-BY-SA-3.0-2.5-2.0-1.0, via Wikimedia Commons. I really think that Claire and I are kindred spirits! We both moved to big cities after college (although I went to Chicago) from the same Midwest town and both found refuge and comfort in the library! What a wonderful story! About The Key and The Flame: Holly wants an adventure. So when her family travels to England, Holly is sure that an adventure awaits. When they arrive, the elderly caretaker of their cottage gives Holly a gift-a key. Holly soon discovers this key is no ordinary key, but has the ability to unlock another world where magic is outlawed and Holly is mistaken for an adept-one who practices magic and must be hunted. When her brother Ben and friend Everett are kidnapped by a ruthless king, Holly must discover the magic within herself to have the adventure she's been waiting for! GreenBeanTeenQueen Says: Ok, first off, big props to the Simon & Schuster marketing team for creating an awesome cover. I was reading this book in bed one evening when Mr. GreenBeanSexyMan (who is notoriously picky about his books) picked this one and said "that looks interesting and it has a great cover!" So anytime you can get him to pick up a book, extra points from me! The Key and the Flame is an epic adventure that tween readers of fantasy will love. With echoes of Narnia, tweens will love the fantastical worlds, creatures and medieval setting that Holly, Ben and Everett find themselves in. The story started off a bit slowly for my taste, but once it got going and the trio found themselves in a magical world, the plot picked up and the adventure was non-stop. There is a full cast of characters that awaits readers and the story is full of magical surprises. If you have tween readers who are wanting the next fantasy series to get hooked on, give them The Key and the Flame for a nice blend of magic, friendship, and history. Loved hearing about Clare's experiences at the New York libraries. I'd definitely have culture shock if I moved there. Can't wait to read her book. It sounds awesome.